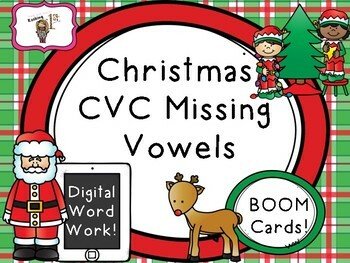 This set of task cards is a very MERRY way for kiddos to practice identifying the vowel sounds in CVC words. 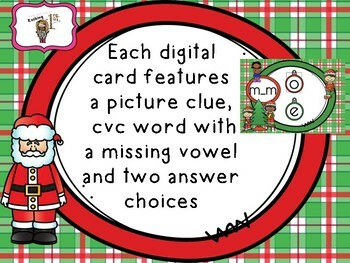 Each card features a cvc word with a missing vowel, a picture cue and two vowels. 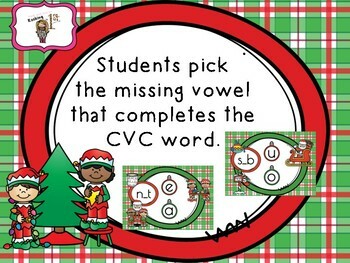 Students must read the word using the picture cue, segment the sounds and click the missing vowel. Quick and easy practice! Welcome to quick and easy, NO PREP literacy Centers! 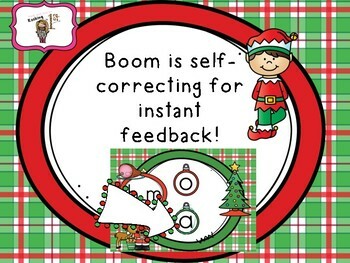 If you haven't checked out BOOM learning, then you are missing out! Boom Learning is a free online program that allows you a way to engage your students in digital word work, math center activities, etc. No printing, laminating, and cutting needed! You can use the program on IPADs, Interactive whiteboards, and laptops. It is super easy to set up for your classroom! You can check out Boom by following the link given in the preview!